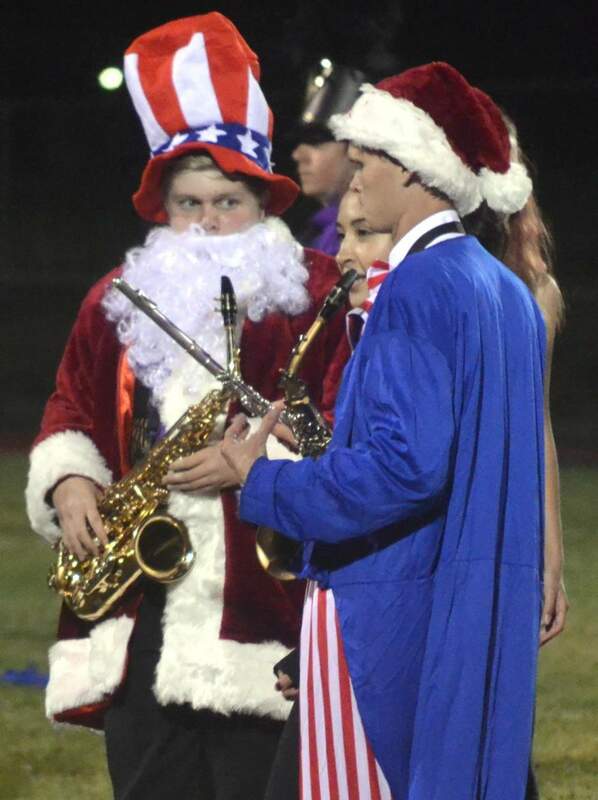 Santa Claus, played by Colton Stumpf, and Uncle Sam, played by Alex Svanes, receive official pre-fight instructions prior to their headlining encounter in the Marching Wolverines’ “Uncle Sam vs. Santa Claus” halftime performance. For the first time in school history, Bayfield High School took a first-place award at regionals in Grand Junction. All of the band members’ hard work culminates this weekend and Monday at two more competitions more than 400 miles apart. On Saturday, it competes at the Zia Marching Band Fiesta at the University of New Mexico in Albuquerque. After coming home for a night, the 61 band members travel to Grand Junction on Sunday and compete at 9:15 a.m. Monday morning against five other bands in the state semifinals 1A category of the Colorado Bandmasters Association State Championships. The top three bands move into the 1A finals late Monday afternoon.